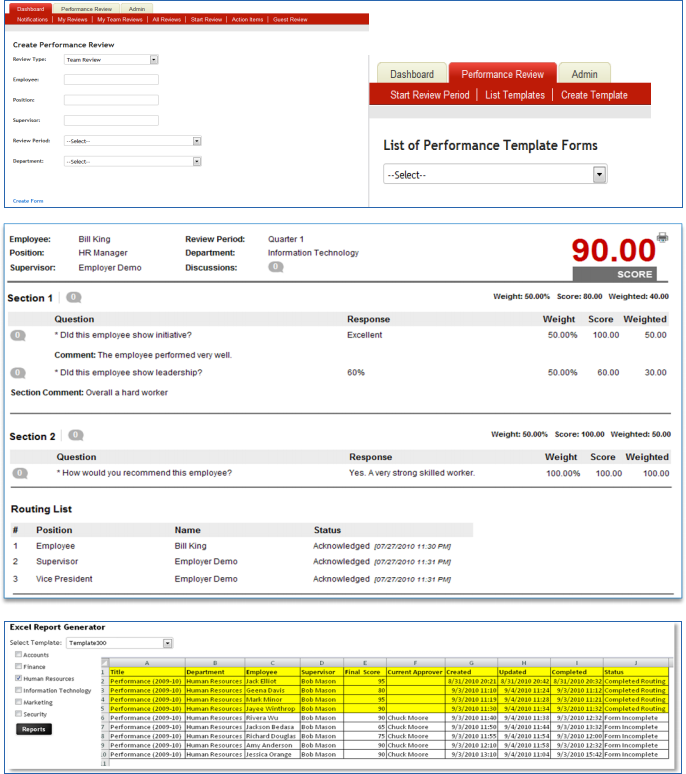 For higher education HR administrators and supervisors, Hirezon’s Performance Evaluation & Management System provides the ability to quickly create customized online performance evaluation forms to accommodate the needs of employees (including exempt and non-exempt), specific departments, and various job types. HR administrators have wide flexibility in assigning evaluation form editing privileges to supervisors. Performance evaluation forms can include performance goals and competency ratings, with or without weighted scores (e.g., rating scale 1-5 or 1-100). Weighting can be independently turned on or off for each rating distribution. The Hirezon Performance Evaluation & Management System has features to allow employee self-appraisal and 360-degree reviewer input. Everyone involved in the performance assessment process has instant access to employee performance data from any Internet-connected computer. The Performance Evaluation & Management System also provides a comprehensive online audit trail. Configurable settings allow online routing of performance evaluation forms for higher education. For example, beginning with an employee self-appraisal, the performance evaluation form can be sent to the supervisor for comments, editing and ranking, then to the next supervisory level (if needed) for review and approval, back to the supervisor for a meeting with the employee, then back to the employee for comments and acknowledgment that the evaluation was completed. The final stop would be with HR. The system provides email notifications to employees and supervisors regarding the routing order. Hirezon’s Performance Evaluation & Management System is compliant with industry-wide standards for login, email and overall security, and collects and maintains performance appraisal information using HTTPS/2048-bit encryption. Our data centers are SOC 1, SOC 2 and SOC 3 certified. The Hirezon Performance Evaluation & Management System has reporting capabilities for all users to manage the evaluation cycle in terms of where supervisors or employee are in the process. Also, the reports help identify individual employee strengths and weaknesses based on the respective performance ratings. Tracks and archives information through all phases of the performance evaluation process. The institution has full control over the retention and destruction of historical performance evaluation forms.